Our Hawaii family vacations start at $543 per person, double occupancy. * They're a great way to spend quality and uninterrupted time with family. It doesn’t matter whether your family is comprised of two people or you plan an excursion with your extended family. Panda Travel ® can help make the most of your budget for your upcoming trip to Hawaii no matter how big or small. Hawaii resort vacation packages, combining air and hotel, start at $943 per person, double occupancy. * There are no shortage of resorts in Hawaii. But finding the right one for your specific needs can be challenging and that’s where Panda ® comes in. With decades of experience, Panda ® can help you select the right resort for your vacation. Our Hawaii luxury vacation packages range from $943 to $1,537 per person, double occupancy*. Hawaii is one of the most ideal vacation destinations in the world. As a result, there is certainly no shortage of luxury and opulence if that is the type of vacationing you prefer. Check out our Panda ® Online website to plan your dream vacation. We’ll tell you why you should book Hawaii multi island vacation packages. Planning to visit Hawaii? 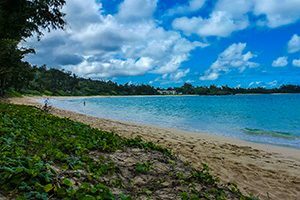 Make the most of your money by investing in one of a number of Hawaii multi island vacation packages. We’ll tell why and how you should do it here. Why Book Hawaii Multi Island Vacation Packages? Many visitors traveling to Hawaii limit themselves to seeing only one island. 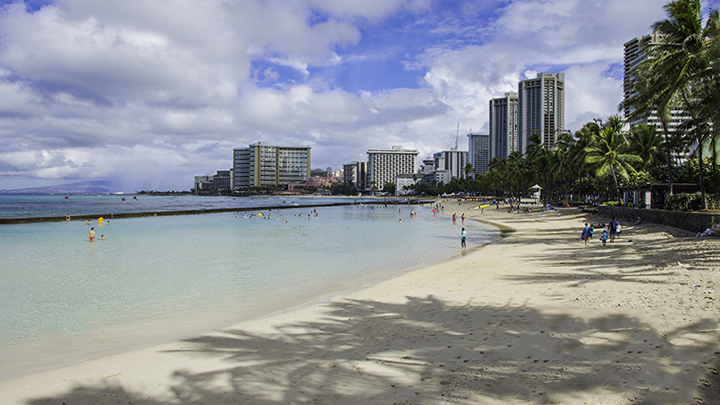 Most of them visit Oahu, the island with Hawaii’s largest tourist destination area, Waikiki. But there is more to see on the other islands too. Such islands include Kauai, Maui, Molokai and the Big Island of Hawaii. The below is just a small sample of what you can experience. View of Kalalau Valley on Kauai. 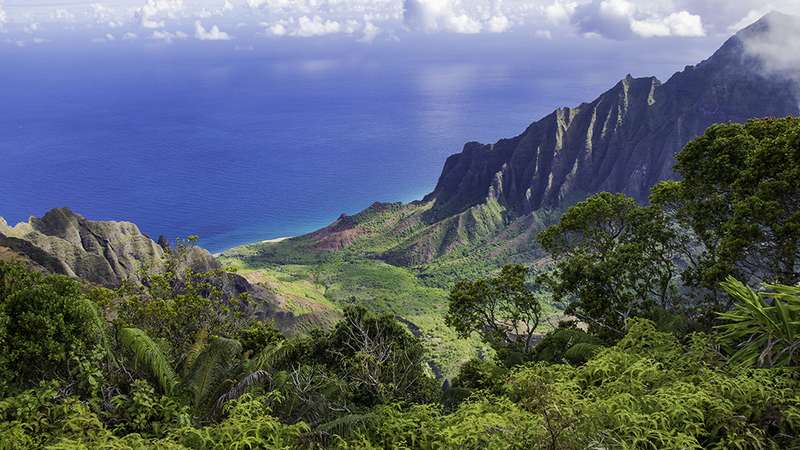 Kauai is the home to arguably the most scenic and remote coastline in Hawaii. The Na Pali Coast has been immortalized in blockbuster movies. They include Jurassic Park, King Kong and Pirates of the Caribbean. The area is remote and only accessible by boat or by air. For those who appreciate a lush tropical setting alongside picturesque shorelines, Kauai is the place for you. 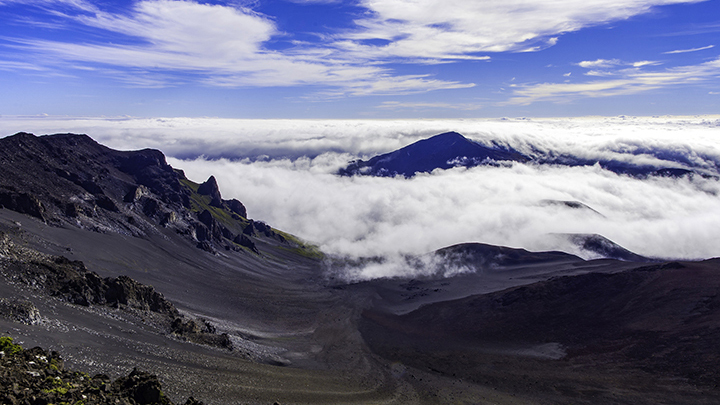 View of Haleakala crater on Maui. One of Maui’s many jewels is its iconic Hana Highway. Here, the goal of traveling on the winding and scenic narrow road is the journey, rather than the destination. You can also visit Haleakala National Park. A spectacular arise with views of Maui and neighboring islands awaits you after driving to 10,000-foot Haleakala’s summit. View of the Kalaupapa peninsula on Molokai. Want to get away from it all and enjoy solitude within a rustic, unhurried setting? If so, then Molokai is for you. You can bask on the sands of virtually isolated beaches. 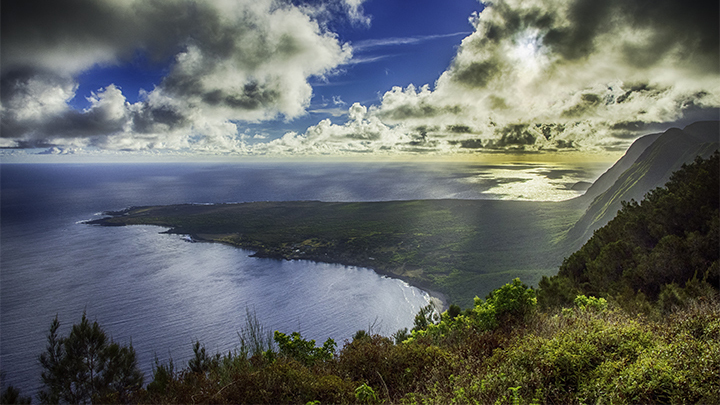 Enjoy views of the world’s highest sea cliffs at Kalaupapa lookout. Or you can travel down beautiful Halawa Valley, one Hawaii’s most secluded and isolated valleys. Kilauea crater on the Big Island of Hawaii. A tip to the Big Island of Hawaii will reward you with unforgettable memories. Where else can you see a volcanic eruption and lava flowing to the sea up close? 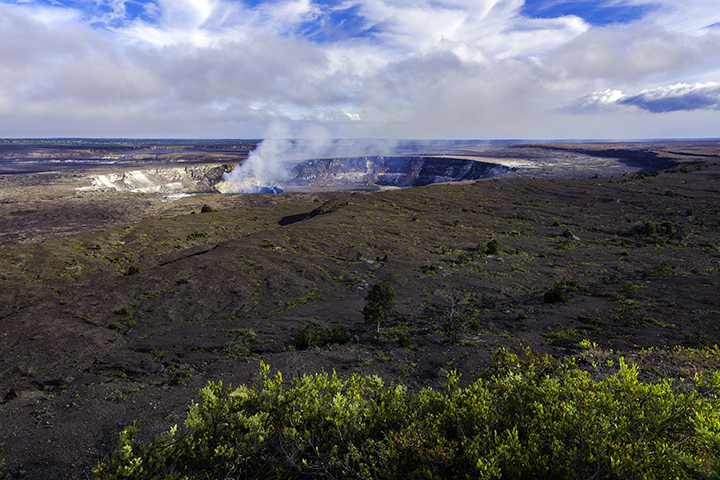 The island is home to one of America’s most famous national parks, Hawaii Volcanoes National Park. If you like unusual beaches, you can see them here. This islands has unique green and black sand beaches. It also has many visually stunning waterfalls as well as some of the tallest and largest volcanic peaks in the world. These are just small samples of what each island has to offer. 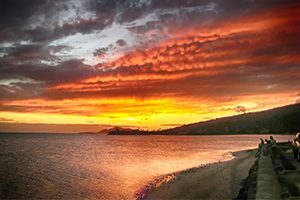 This is why traveling to more than one Hawaiian island is a way to fully enhance your trip to Hawaii. And this will surely make it a most memorable one. All of these island are less than a 1 hour flight from each other. So you can travel from one island to another fairly quickly and easily. You can certainly book Hawaii vacation packages on any of the major travel and airline websites. The benefit of booking a vacation package, which typically includes booking a flight, hotel room, rental car and/or activities, is you can generally save more in a bundle than booking them individually. You can definitely book a complete package if you travel to one Hawaiian island. But for the most part, you will have to book another itinerary if you want a package to another island. 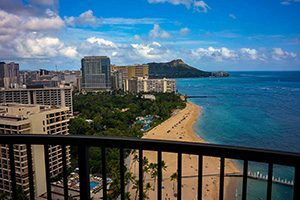 Many travelers are not aware that most online travel software cannot accommodate packages to more than one Hawaiian island. Perhaps this is because, travel to Hawaii is unique in many perspectives. As a result, this requirement hasn’t been incorporated into most travel booking software in the market. Right now, because they specialize in travel to and within Hawaii, only Hawaiian Airlines and Panda Travel ®, Hawaii’s largest travel agency, can book Hawaii multi island vacation packages into single travel itineraries. Whatever the case, you should certainly shop around for the best deals. But generally, the more components you can package (i.e., booking more than one island) into a single itinerary, the bigger the discount will be.